Hurvin Anderson was born in 1965 in Birmingham, UK. He studied at Wimbledon School of Art and Royal College of Art, London. Selected solo exhibitions include Foreign Body, Michael Werner Gallery, New York, USA (2016); Backdrop, Art Gallery of Ontario, Toronto, Canada (2016); Dub Versions, New Art Exchange, Nottingham, UK (2016); Backdrop, CAM, St.Louis, USA (2015); Reporting Back, IKON Gallery, Birmingham, UK (2013); Subtitles, Michael Werner Gallery, New York, USA (2011); and ART NOW: Hurvin Anderson, Tate Britain, London, UK (2009). He has participated in numerous group exhibitions including Making & Unmaking, Camden Art Centre, London, UK (2016); Poetics of Relation, Pérez Art Museum, Miami, USA (2014); Flowers for Summer, Michael Werner Gallery, New York, USA (2011); and Dull as I am, I hope to Live by These Lines, Simon Preston Gallery, New York, USA (2010). Anderson’s vibrant paintings draw on the genres of still-life, landscape and portraiture to explore the way community and identity can be represented. 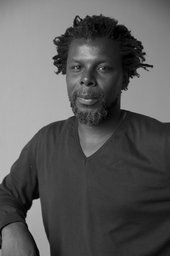 Born in Birmingham to Jamaican parents, Anderson’s practice touches upon his Jamaican heritage as well as referencing wider art history. Repeated images such as the interior of barbershops appear throughout his paintings as a place synonymous with enterprise, affirmation and community for many Afro-Caribbean migrants. His work pays homage to this cultural history and explores themes of memory, identity and nationhood. Painted on canvas and paper, Anderson’s scenes shift between abstract and representational focus. He frequently overlays his paintings with decorative screens and abstract patterns which interfere with the landscapes underneath. These screens can be seen as references to the security grills often found around properties in the Caribbean to mark the threshold between public and private space. They also combine the distinct art historical genres of figurative landscape and modernist abstraction while creating a unique sense of place and identity. While the artist’s work draws on his own political and social context, he is never directly critical. In recent paintings his subject matter has become more explicit with representations of Black icons, such as Malcom X and Martin Luther King, such as in Is it Okay to be Black? 2016. 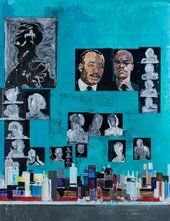 Anderson references the creativity and visibility of Blackness within contemporary society, paying homage to his cultural and political forebears while also contributing to discussions about the legacy of painting. Hurvin Anderson is 52 and lives and works in London.